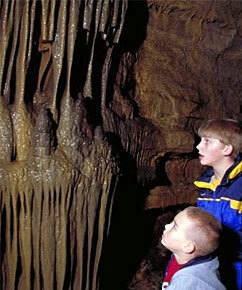 School tours of Mystery Cave are designed for grades K-12. Students will be exposed to speleothems, rocks, and groundwater, and they will be introduced to the fundamental processes that involve limestone cave formation around the globe. School tours are available by pre-arrangement only. Reservations are required for the wild caving, photography, school, and advanced educational tours. Spring and fall school tour reservations can be made by calling the main park office at 507-352-5111. Wild caving, photography, advanced education, and summer school tours can be reserved by calling Mystery Cave at 507-937-3251.